An all-white look is not easy to design as too much of the same look and you are bound to be stuck with interiors that may seem bland and boring. Too little of the same and you risk not executing the look to perfection. However, it is hard not to like a room that is dominated by white. White is eternal and forever and therefore with such a design you get a look that is classic. Timeless and relevant is how you can describe the designs created by the interior designers and decorators of Rubenius Interiors in Bengaluru. Each room has been completed in white hues that seem to have been complemented with a contrasting element. 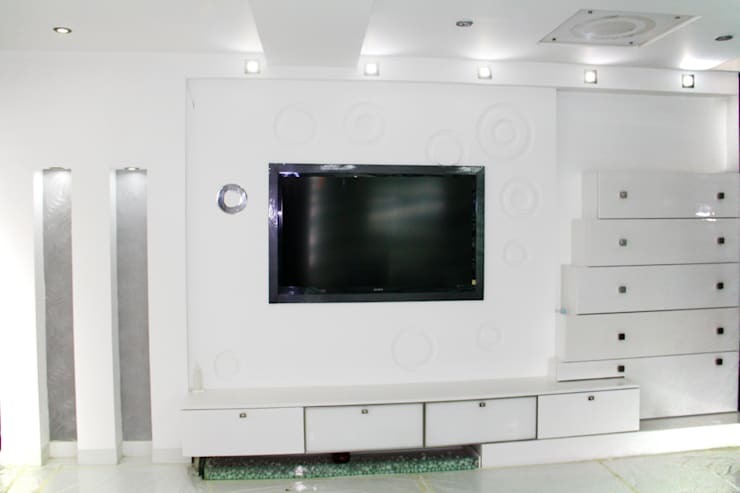 Functionality does remain the single most important aspect when it comes to designing interiors. Yet, while doing so, adding an element of interest and design makes a space that much more endearing and stylish. Here, the vast expanse of white in the TV unit has been broken up by small accents such as knobs which have been finished in a darker tone. Additionally, lighting has been used in the ceiling to brighten up the interiors. The texture is everything when it comes to using a single colour and here, to create that look, the designers have chosen a mural which has been carved into the wall behind the bed. 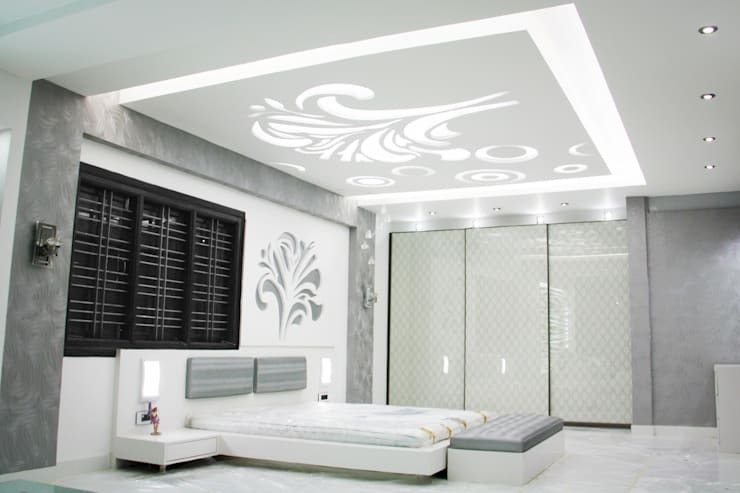 In order to maintain consistency and to add a little bit of drama, the same pattern has been etched into the ceiling of this modern bedroom. What provides the contrast here are the slightly darker tones of the same shade and the window which has been left bare. You can see that the wardrobes have a simplistic touch which works very well with the overall design. 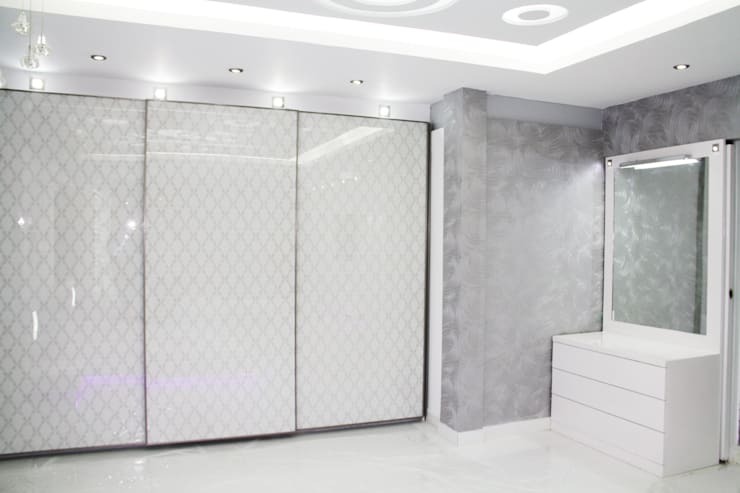 This is a simple wardrobe design in the room has a modern look thanks to the glossy and ultra-cool finish. A self-patterned laminate in a subtle and neutral tone has been used to add texture. The pattern on walls is subtle enough to blend in with the other elements in the room. A dresser which has a modern yet modest pattern has found a place in one corner. A large mirror sits majestically above the dresser completing the design. The absence of handles, knobs or other elements as is seen in this room is important especially when you are going for a clean and sophisticated look. 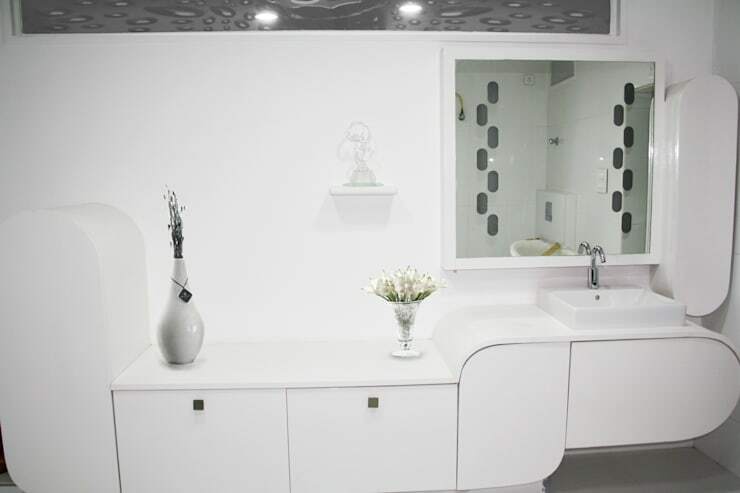 All-white bathroom gives an ultra-stylish and modern look to any space. Here, you can see a wall has been dedicated to the same. A small and compact mirror has been added to the wall and a unit has been created around it. Abundant lighting and simplistic design in terms of cabinets and drawers support the overall design.